I forgot to post this image when I made it around three weeks ago. I just found it again tonight. I've taken this shot before, however, on May 24th, Hugh and I went to see a movie there at the end of an unusually warm day for May. The light was incredible in the sky before we went into the theater. When the movie was over, we were greeted by sheets and sheets of rain from a severe thunderstorm! 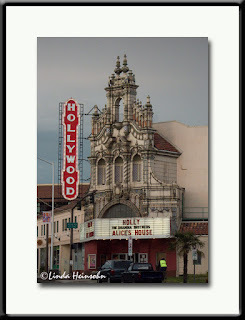 I love the light in this photo; it brings out the detail in the movie theater facade. Click on the photo to see the detail.